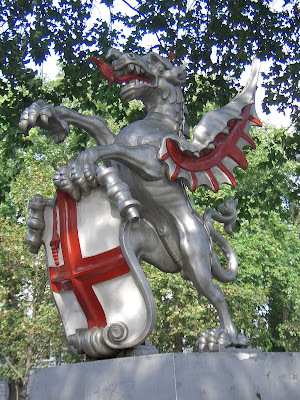 This is a cast iron dragon, that you would pass if you walked into the City of London from Victoria Embankment. The south end of Blackfriars Bridge. There's also a more terrifying dragon at Temple Bar. In fact, if you're heading into the City of London from any main road, you can't help but pass a dragon! Look! Here's a map! Is this because secretly it was a dragon that started the Great Fire of London? 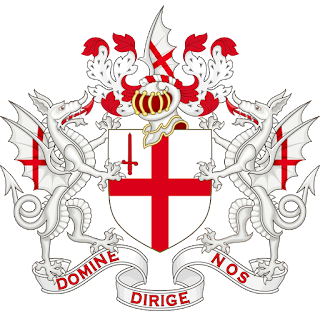 Sadly no, but dragons have been on the City of London Coat of Arms since at least 1609. Nobody's quite sure why, especially with the St George's cross everywhere, which has to be farly anti-dragon, don't you think? 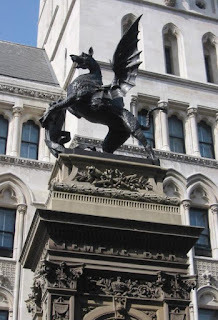 But whatever the reason, in 1964, the Corporation of London decided to put these dragons along the boundary of the City of London, choosing the Victoria Embankment design over the Temple Bar one, as it was less scary.